As I indicated yesterday, Friday's run on the Smithville Lake MTB trails was more like a play date in the woods than an all-out run. My plan was to run the whole trail system and just groove out in the woods. Though my favorite wicked little voice in my head said, "You could run it TWICE, you know, you have all day," it quickly became apparent that it wasn't going to be the kind of day where I'd bust myself for distance. It was going to be the kind of day to lose myself in the woods. I stepped onto the trail at 10:30 and promptly flushed a female American Redstart where she was grubbing beside the trail. How my foot almost came down on a bird I'll never know. She flew up and beat her wings against my moving leg. I could feel her breast on my calf, her fluttering wing wrapping around. She flew away, yellow tail bars flashing. I ran the rocky Lakeside Speedway and the calmer Posson Trot and stopped to stretch and check my pace. 11:30ish. Fair enough. For the rest of the morning, when I was running, that's about how fast I was going. Between 11 and 12 minutes, except for some fast, smooth downhills. 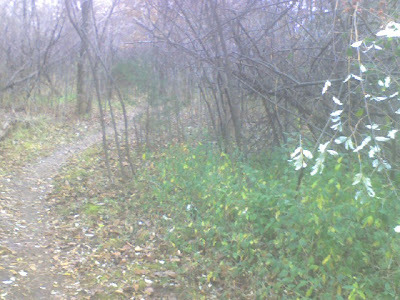 The trails at Smithville — oh my god, FUN. Astounding variety. I have a huge fangirl crush on ERTA now for their trail genius. 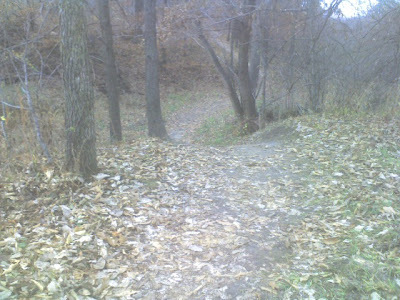 The easy trails are supereasy; the difficult trails feature long low-to-medium-difficulty stretches and short, notable, high-difficulty sections. The system weaves around the backbone of a paved trail, so it's easy to enter the singletrack at a number of points. 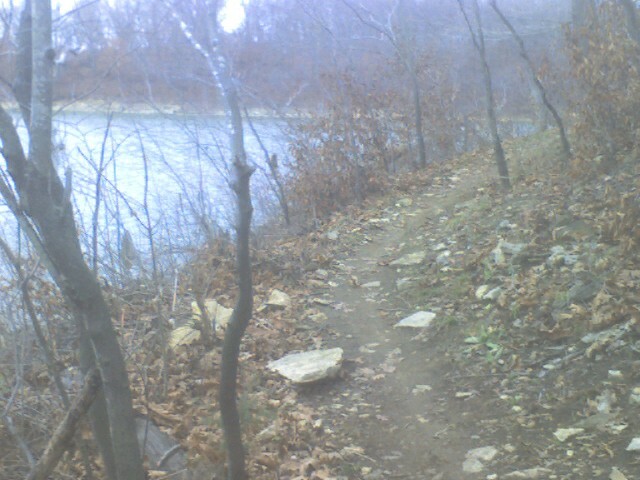 Throughout the trails, you can expect sharp down and ups at the creeks. For runners, something to watch for are the bits of very narrow singletrack that will force you to put one foot almost directly in front of the other. The trails rated "most difficult" are, yeah, difficult. You don't want to take a bad bounce in the direction of the lake. I tried to get some good pics of one down-and-up on Pulpit but it was too steep to allow an adequate phone camera angle. So here's one of the view instead. Ol' Grandad is maybe my favorite place I've ever run. Twisting, up and down, not too rocky but enough stuff to keep you awake — my arms were helicoptering on the downhills, which made me laugh out loud. Yeah. On the whole, when I was running, I was smiling. When I wasn't running, I was stopped. I stopped to stretch. I stopped to drink. I stopped at intersections. I stopped for odd noises. I stopped to look at meadows and creeks. I stopped to daydream. I stopped once inadvertently. (I looked straight at a rock and thought, yow, don't trip on that rock. Lesson learned.) I stopped to lock eyes with a fat, yearling doe before she let me chase her a few yards. I stopped every mile or so. And then I ran. I ran over extremely fun obstacles — logs, rock stairs, log pile and other creek crossings; ran uphill and down. Walked a bit of Happy Jack — the open, more XC bit beside the cornfield. Trudged a bit of uphills — after 9 miles my legs were a little tired — but then the trail would get too pretty again and I had to run. And, um, picked my way through a couple of bits of Pulpit. Because of all the stops, my heart rate never went crazy and I stayed fresh until the very last bit of T-N-T (well named). I also didn't get the high that comes with redlining, with hammering out a wild run. I wanted to see the trails; I traded off pummeling the run. In retrospect, it was a slightly less than even trade, but I'm glad I saw all those trails. I'll go back. As for working out the running issues: yeah, I do have a better grasp now on how fast is fast, how slow is slow, how far is far. (This was on the mental loop through the morning. It cracked me up.) I got to very patiently work with my form, and that felt good. I got to run easy. And the NB 100s are money well spent. They shed water nicely and have pretty good lateral support. They saved my ankle on Pulpit. As for working out the existential knots: it was so quiet out there. Not silent — quiet. It made me quiet. When you are alone in the woods for three hours, you have to be enough for yourself. But not feeling my physical heart hammering, the run felt very disassociated from my awareness. It was like running in a dream instead of in a body. It wasn't until the next day that I realized those painful mental knots had gone completely numb. I went to work on them with scalpel and blowtorch and figured some things out. So that's good. At 1:30 I was back at my car. After three hours I was hungry and my water was gone. Because of some doubling back, I'd covered 11.5 miles. I hadn't seen Neale's, one of the two "most difficult" trails. The tops of my feet were yelping, though I'd stopped and relaced my shoes without the top eyelet. My knee, which had started the day with a dull twinge, felt great. Glutes and calves had done some work and were making quitting time noises. Yeah, well, pals, TOUGH. A few bites of a sandwich, a handful of trail mix, two bottles of water, and nearly a quart of OJ later, I was ready to sing along with the wicked little voice. Time to open the throttle. I went back to Lakeside Speedway and ran hell for leather until my heart was hammering. All that disassociated feeling? The run slammed right back into my body, full force, like color flooding a line drawing. Body completely connected to awareness. Wow. Ran onto Neale's and got humbled pretty quickly by the difficulty. Like Pulpit, Neale's runs along the edge of a bluff over the lake. It's also extra-rocky and cambered toward the lake. Then I took a slight curve and out of the corner of my right eye saw: Nothing but air. Next thing I knew I was clutching a tree on the left side of the trail going "don't look down don't look down don't look down." Ah, vertigo. How you keep life interesting. After that my legs were shaking so I stumbled a couple of times and decided to walk it out until I was facing away from the lake again. Yeesh. By the time I hit the paved path, I knew I was done for the day. 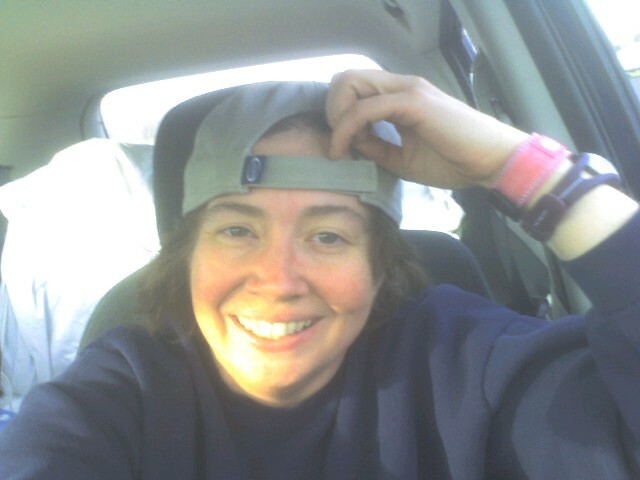 I stretched and walked the quarter mile out to the car, feeling great. 14 miles. Or one mile, 14 times. Either way.